Premium In-Line Back Draft Dampers are specifically designed to stop backdrafts from the clothes dryer, bathroom exhaust fan, and kitchen exhaust fan. 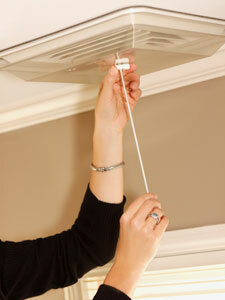 Add a damper to seal the ducts that allow cold drafts to enter the home. In many homes, outdoor air can leak into the home through the bathroom fan, kitchen hood, and clothes dryer exhaust ducts. A simple solution that will stop the drafts and improve the comfort of the home is a backdraft damper. During the winter, in many homes the bathrooms, clothes dryer and kitchen are the coldest rooms in the house. Exhaust fans in bathrooms, kitchen and the clothes dryer are connected to an exhaust duct that is open to the outdoors. In the winter, cold air leaks in through the duct, and into the house. In the summer, hot damp air can leak in through the ducts, bringing pollen and other pollutants into the home with it. A damper is required to seal the duct between uses, preventing the undesired backflow of outdoor air into the house. Some fans do come with a damper, but are often ineffective. Poor quality dampers can become stuck open with lint, blown open by a breeze, and not seal well. Poor quality dampers can also rattle and create noise, especially on windy days. An easy, low-cost solution to this problem is to add a backdraft damper. The Premium Back Draft Damper by Battic Door Energy is a non-mechanical in-line one way air flow valve that requires minimal pressure to operate, has no moving parts and has been tested to ASTM E84, UL 723 and NFPA 255 standards. It was specifically designed to stop backdrafts from the clothes dryer, bathroom exhaust fan, kitchen exhaust fan. The Premium Back Draft Damper consists of a specially formulated fabric sleeve attached to an outer metal sleeve. The fabric sleeve will allow air to pass through in the desired direction of flow with minimal reduction in airflow. It is silent, produces no metal clanging sounds, and can be installed at any angle in flexible or rigid metal ductwork. It is available in 4, 5, 6, 7, and 8 in. sizes. The installation is easily - simply slide into duct. 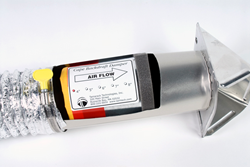 The damper is sized 1/8 inch smaller than the duct and installs easily. A rubber gasket creates an air tight seal. 1. Seal the fireplace with an inflatable Fireplace Draft Stopper. This device plugs the chimney between uses of the fireplace, preventing energy loss and downdrafts. Cost is about $55. 2. Cover, seal and insulate the pull down ladder with an R-50 Attic Stair Cover. Available in 3 sizes to fit any brand or model pull down ladder, this cover will prevent drafts and energy loss. Cost is about $99. 3. Seal and insulate the whole house attic fan with a Shutter Seal. Available in trim to fit kits to fit whole house fans up to 4 ft x 5 ft, this cover will prevent drafts and energy loss. Kits start at $29. For more tips and ideas to prevent energy loss, visit the Battic Door Energy website at http://www.batticdoor.com. ABOUT THE AUTHOR - Mark D. Tyrol is a Professional Engineer specializing in cause and origin of construction defects. He developed several residential energy conservation products including an attic stair cover and an attic access door. Battic Door Energy Conservation is the US distributor of the fireplace plug. To learn more visit http://www.batticdoor.com.